Above and beyond isn’t enough to describe these grantees. Each month, we’ll be featuring a new interview with an organization from our NEA Big Read community. 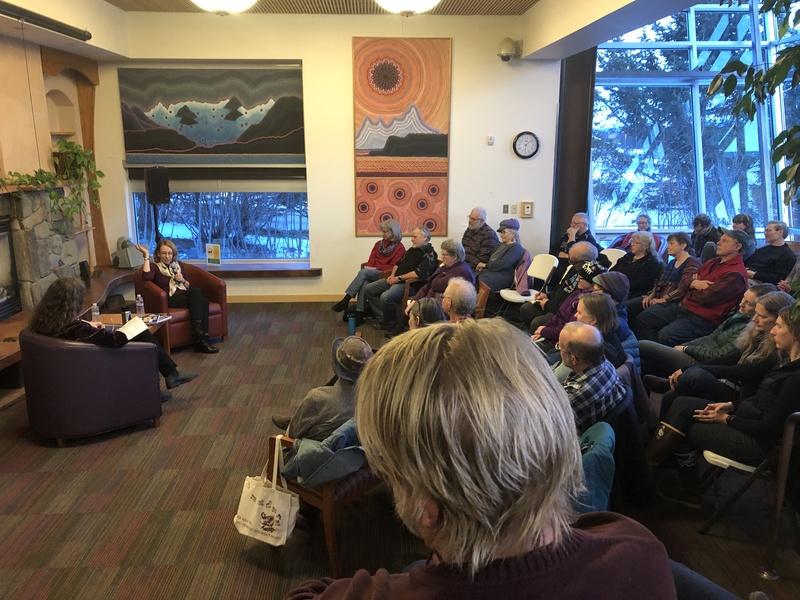 This month, Coordinator Mercedes Harness chats with us about this year’s NEA Big Read in Homer, AK: region-wide collaboration, honoring caregivers in the community, and conversations that extend beyond events. Tell us a little bit about your organization! Friends of the Homer Library is a nonprofit whose mission is to provide volunteer support for library programs and services, to raise funds that enrich the library experience and to promote the use and enjoyment of the library. In practice, this means we work closely with library staff to enhance the library experience by pursuing meaningful grants and programs such as the Big Read, civic events, author readings, and more. We also purchase supplies for storytimes and help with the planning and implementation of the Summer Reading & Learning Program. Our goal is to encourage community members to become lifelong learners by using and enjoying their local library. 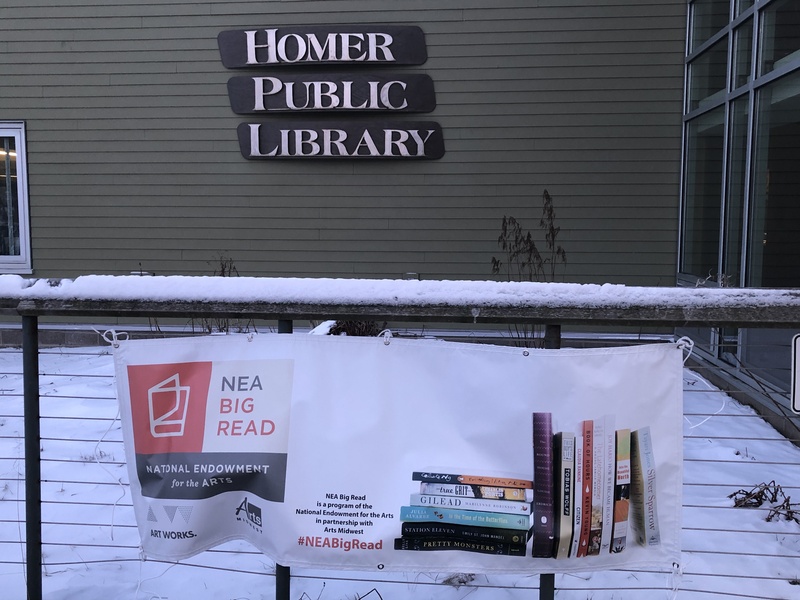 NEA Big Read banner in front of the Homer Public Library. Photo by Joshua Feist. Who is your community and how do you connect with them? Our community covers a large geographic area on the lower Kenai Peninsula in Alaska. Homer is the main town, surrounded by the smaller communities of Kachemak City, Fritz Creek, and Anchor Point. We also serve Old Believer Russian villages Voznesenka and Kachemak Selo, as well as other small Native Alaskan villages. The nearest large city (Anchorage) is 227 road miles away. The Homer-area is not only geographically spread out, but also ideologically diverse. We strive to offer programs that have wide appeal, and that encourage all members of the community to feel welcome at their library. Our civic events such as Candidate Forums, have high attendance and attract people across the political spectrum. We offer a monthly print and email newsletter which enables us to connect with members of the Friends and frequent library users. We also connect with the public on Facebook. We have found it to be effective to post our flyers on community pages that reach individuals who might not otherwise access the library. 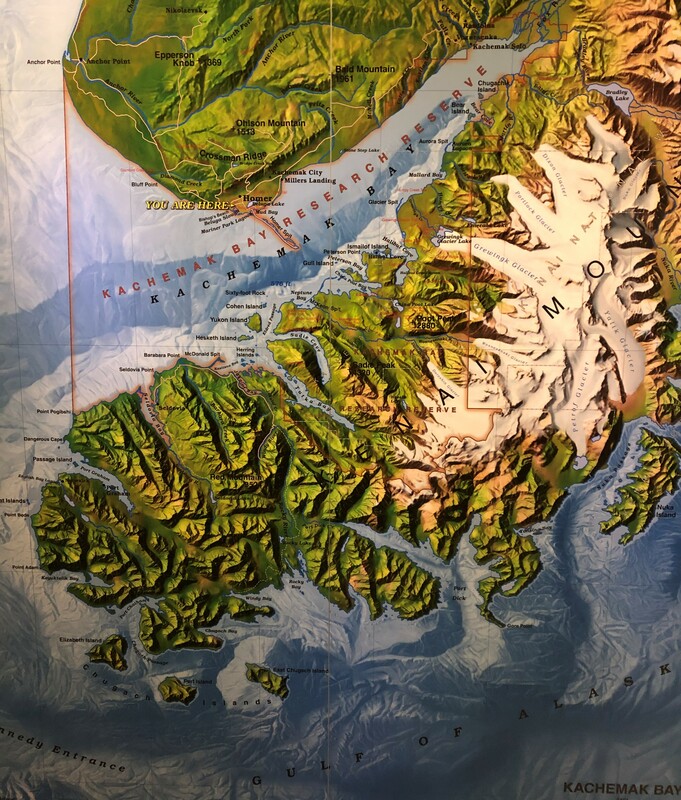 Map of Homer, AK. Photo by Joshua Feist. What makes your Big Read unique? Because we are so far removed from a large population center, the culture of the community has evolved to prioritize collaboration. 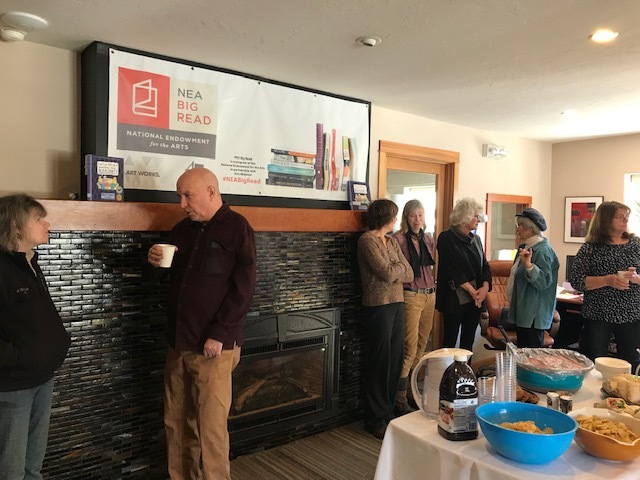 When we (FHL) ask organizations and individuals if they would like to collaborate with us on Big Read events, our request is met with enthusiasm. The result is that even in the preliminary planning stages, we already have a huge buy-in, so by the time the Kickoff starts, the excitement for the Big Read is tangible. Roz Chast signing books at the Homer Bookstore. Photo courtesy of the Homer Public Library. Why did you select this particular book and how have you seen your community engage with your selection? Through a mix of four-color cartoons, family photos, sketches, found documents, and narrative storytelling, Chast’s memoir chronicles the conflicting emotions, memories, and practical challenges of her parents’ last years and passing. Events were overall, well attended. People felt the selection validated their own experiences. A few people expressed distaste for Chast’s humor, while others found it laugh-out-loud funny. These varied responses led to engaging book discussions and events. Luncheon at the Hospice of Homer. Photo courtesy of the Homer Public Library. What aspect of your programming do you feel has been the most impactful? Our panel discussion on End of Life Care brought professionals and family caregivers together to talk about the many aspects and needs of patients, as well as the roles of paid and unpaid care providers. 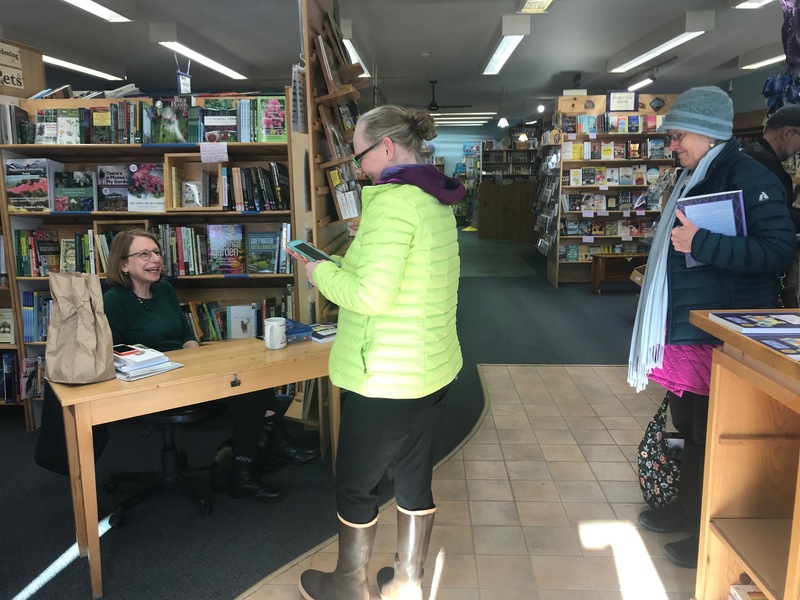 Roz Chast’s visit to the Homer community was the crowning weekend of the Big Read 2019. People were so excited for the opportunity to meet and listen to her talk. 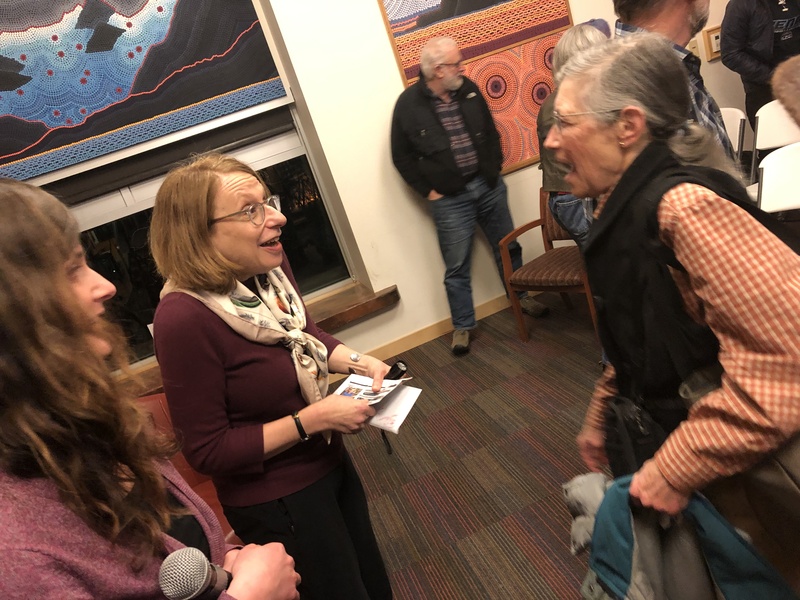 Chast was witty and engaging, and was genuinely interested in our community—the quality conversations that occurred during her visit were the highpoint of the Big Read. 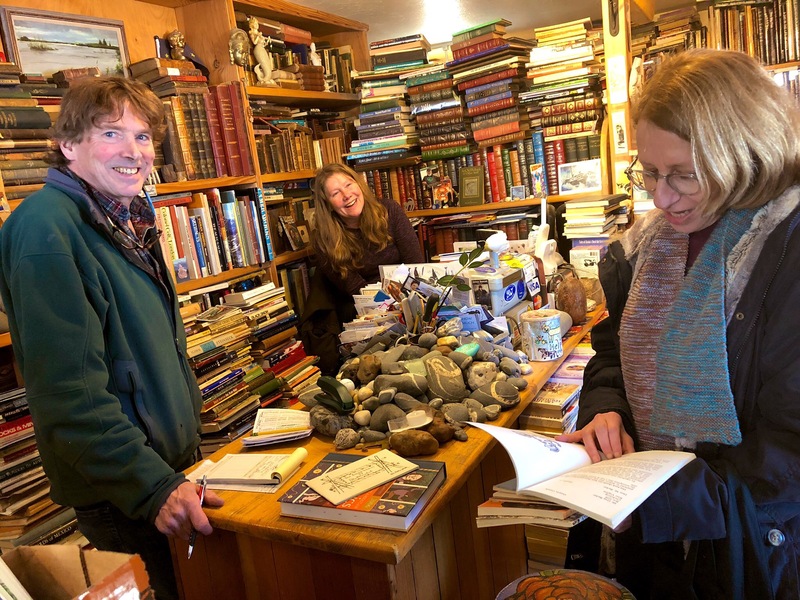 Roz Chast visiting the Old Inlet Bookshop. Photo by Joshua Feist. More generally, what do you think makes a program impactful or successful? Why? Attendance is one measure of successful program—if people come and engage, that in itself is an accomplishment. However, programs which generate conversation that extends beyond the event, carry the most impact and build community. Roz Chast speaking with an attendee at the NEA Big Read keynote. Photo courtesy of the Homer Public Library. Conversation with Roz Chast. Photo by Joshua Feist. Could you talk about some of the events that you felt were more creative or participatory? What was the background or process behind those events? 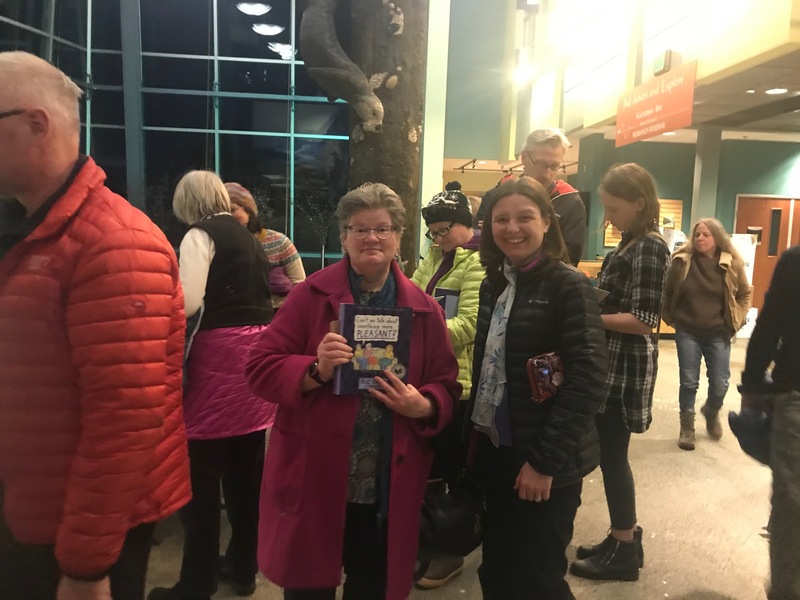 The Big Read 2019 included a Dramaslam with our local community theatre, Pier One. Participants had two days to brainstorm, two days to write, and two days to rehearse skits that were performed at the Kickoff. People wrote and acted pieces about their own experiences caregiving—about the challenges, hardships, and, yes, retrospectively humorous moments. The process was intimate and the outcome was rewarding—and funny. Audience members waiting at the NEA Big Read keynote. Photo courtesy of the Homer Public Library. Could you share any favorite anecdotes or stories from your community, about the book and the program? Lastly: what is your favorite line from your reading selection? 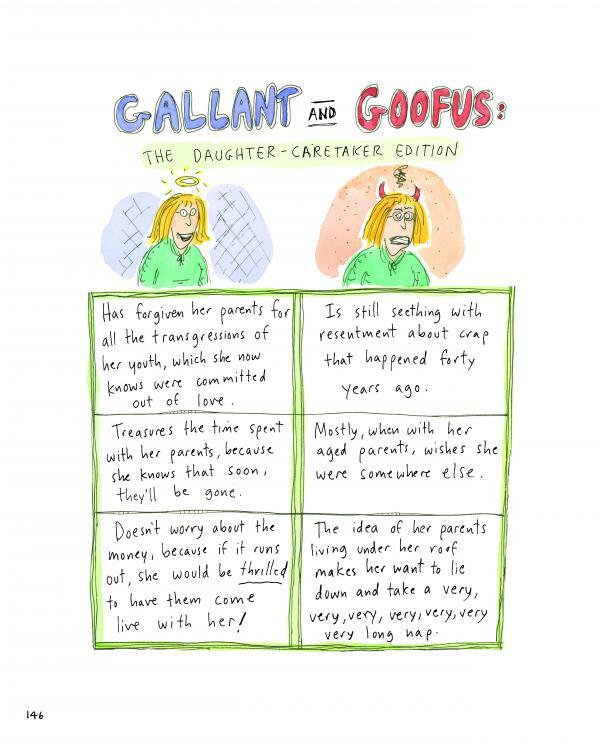 My favorite cartoon is “Gallant and Goofus” on page 146. It addresses how conflicted many individuals are when they care for their parents. Even as you’re trying to do everything right and be good to your aging parents, there can be a sense of resentment—especially if you have unresolved issues with them. We are all so full of contradictions, and nothing illuminates that better than being thrown into the role of family caregiver. It’s a humbling experience.